This is part 5 in a series of posts about my first time trying #20Time Projects with my English 10 Students. In this post, I'll be sharing students' reflections and ideas about their work and the process. Find the previous posts here: Part 1: My Intro to 20 Time Projects, Part 2: Managing Student Workflow, and Part 3: What I'll Do Better Next Time, and Part 4: Sharing Student Products. Welcome to the end, ladies and gentlemen. Next time you read my writing about #20Time, it will likely be in a more cleverly named series about my second year implementing a genius hour-like project. Next Time #20Time might have a decent ring to it, right? 2nd Time #20Time, not so much. Student Rubrics, where students would grade their own work on process, product, and effort. Reflection, asking students for written responses to a series of questions to better examine their meta-cognition. Blog Post, writing a final blog post highlighting the meaning they did or did not find in their work. Most students were fair but challenging graders. They held themselves to high standards. Reflection is wonderful when students take it seriously. The most rewarding part, by far, was reading about students' self-identified growth, challenges, successes, and failures. My students learned a lot more than I realized. 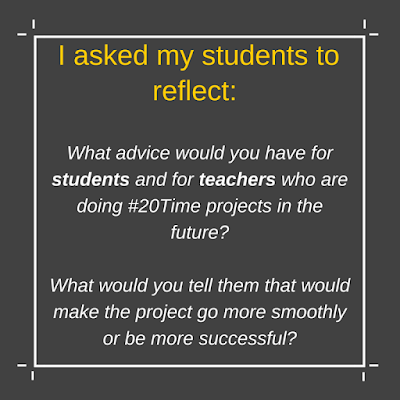 In fact, as I read these reflections, I found myself taking notes on students' responses and documenting their advice and feedback, specifically to this: What advice would you have for students and for teachers who are doing #20Time projects in the future? What would you tell them that would make the project go more smoothly or be more successful? Find excerpts about what they had to say below. It's a bit long but I found that their writing was so much more interesting than mine, so I decided to let this post run wild. 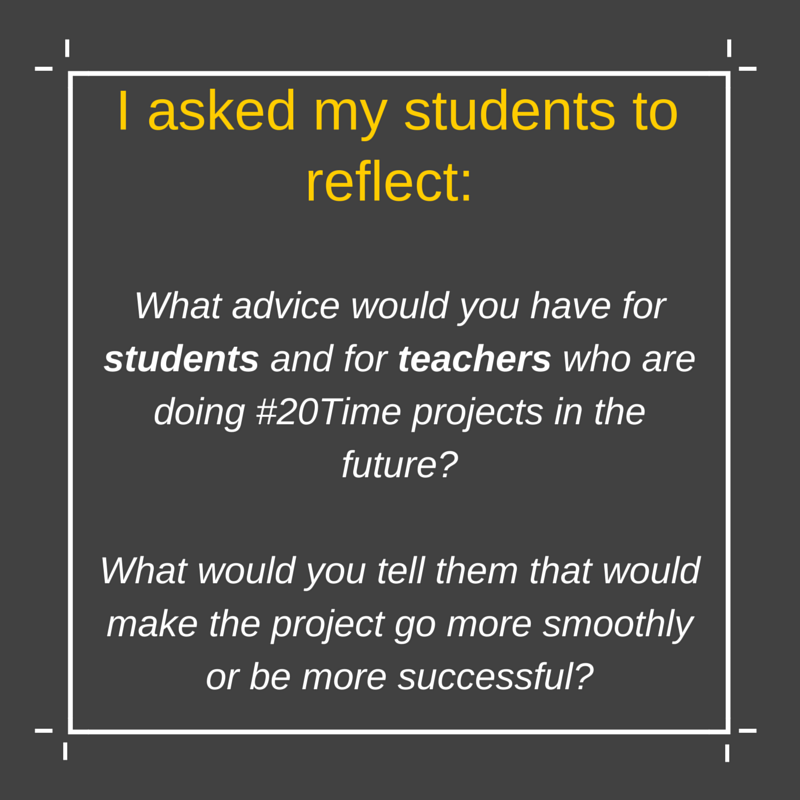 "I would tell students doing the 20Time project to make sure they plan ahead and start on their project immediately. I would also suggest that students have at least 2 backup experts instead of just one, just in case one of them falls through or they decide to alter their topic. In addition to these tips I would tell other students to pick their partners wisely; without their full support and/or ideas you may not get anywhere with your topic." "My advice to other students is to do your blog posts, it’s really not that hard, really think about your topic and pick something you're interested in. Also pick a “doable” topic. Dont pick something that professionals don't know." "Advice that I have for students doing 20% Time in the future is to also plan ahead. Make a schedule that you will not stray away from, and use the time given to you wisely. Do not fall behind and be assertive in your actions. Have a thorough plan and an idea of what you’re trying to do in advance, so that you do not have to rush or fall behind toward the end. The project will take up more than 20% of your time, meaning that you have to do it at home. Lastly, do everything well and do something that you are interested in." 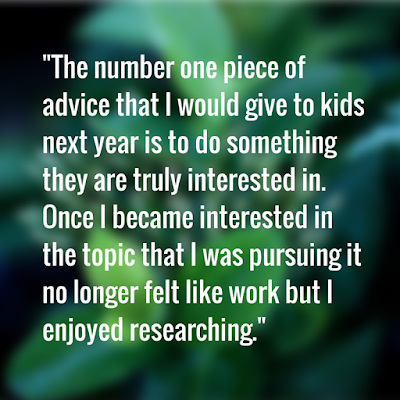 "I would tell the student to put a lot of thought into what they would like to create or research. I would also tell them to think outside of the box, but to have a realistic goal for their final project depending on how much time they have to actually create their final project." "I would tell students to not look at this project as a forced project, but instead as a place to dedicate your passions in investigating." "DO NOT PROCRASTINATE!! Seriously, it won’t be good, you’ll want to have all data collection as soon as possible, so you don’t have to scram to gather information in the last few weeks. Remember that you have other classes, with other assignments to complete, so plan accordingly." 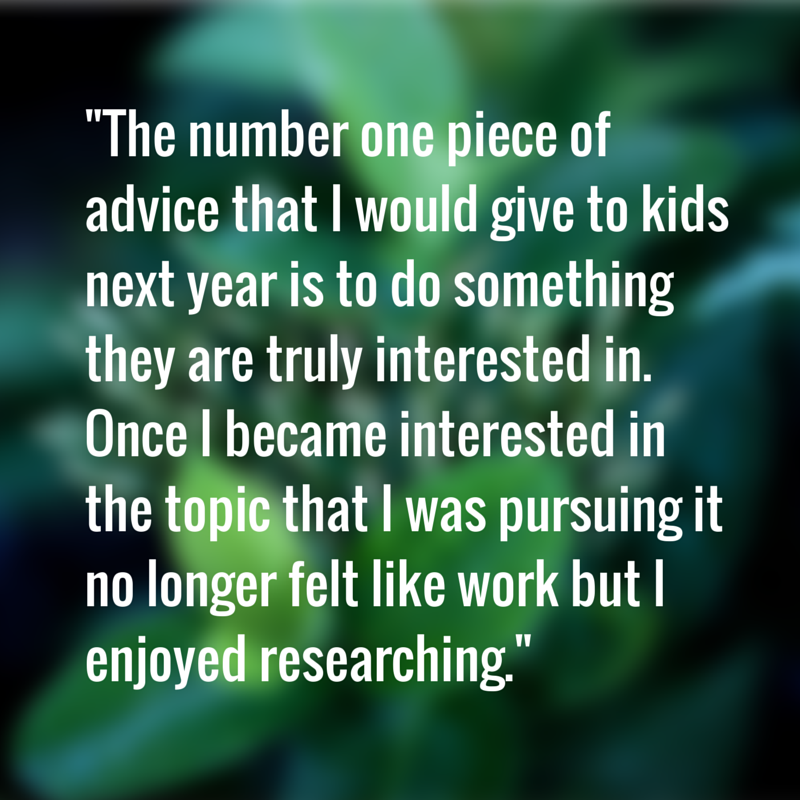 "The number one piece of advice that I would give to kids next year is to do something they are truly interested in. Once I became interested in the topic that I was pursuing it no longer felt like work but I enjoyed researching. 20 time may seem boring at first, as it did for me, but afterwards I felt more knowledgeable about a topic. If I were to do 20 time over, I would have looked more places for research. The majority of my research consisted on newspaper articles, images and YouTube videos. Had I had more time or started sooner, I found out there were documentaries as well as books on the topic. Reading both would have allowed me to find out even more on the topic and master it well. Overall, I really enjoyed the 20 time experience and I am happy to have done it. " "Some advice i would give to students is to really enjoy this project it’s a once in a lifetime project where you can learn about something you’re interested in. So put lots of effort into this to make the outcome in the end a great one. Gain as much knowledge as possible so you can come out of the project saying that was worth it. Most importantly just have fun." "I would tell other students that changes will occur and that there will be obstacles from your plan, or throughout your project. If there is an obstacle and you’re truly passionate about your topic, try going around it rather than just completely giving it up. Also, your project most likely will not come out exactly what you had originally planned because things will change. To make your project go smoothly, ask your expert for help whenever possible. Feeling dumb for 5 minutes is so much better than feeling dumb for days and months till the day your project is due. Always stay in touch with the expert and actually put time into thinking what you will be doing. If you’re going to do the project without thinking how, then you most likely shouldn’t go after it. Always have a plan in mind and have multiple plans in case your original plan doesn’t work out. Most importantly, ASK YOUR TEACHER FOR HELP IF YOU ARE STUCK." "Although you will get assignments to write on your blog, use your blog as a journal don’t be afraid to write down what you’ve done to get closer to your goals, your feelings, etc. Definitely planning ahead and not waiting till last minute will make your project go more smoothly and successfully." "I would advise teachers to make sure their students have enough time in class and outside of school to work with their partners. I would also suggest that teachers give the entire outline of the project when students first start working so they know ahead of time what’s going to be happening." "Teachers who want students to produce something meaningful must give them more than enough time to create something worthwhile. Students can’t have free range in their project, so be sure to set due dates along the way to keep students in check." 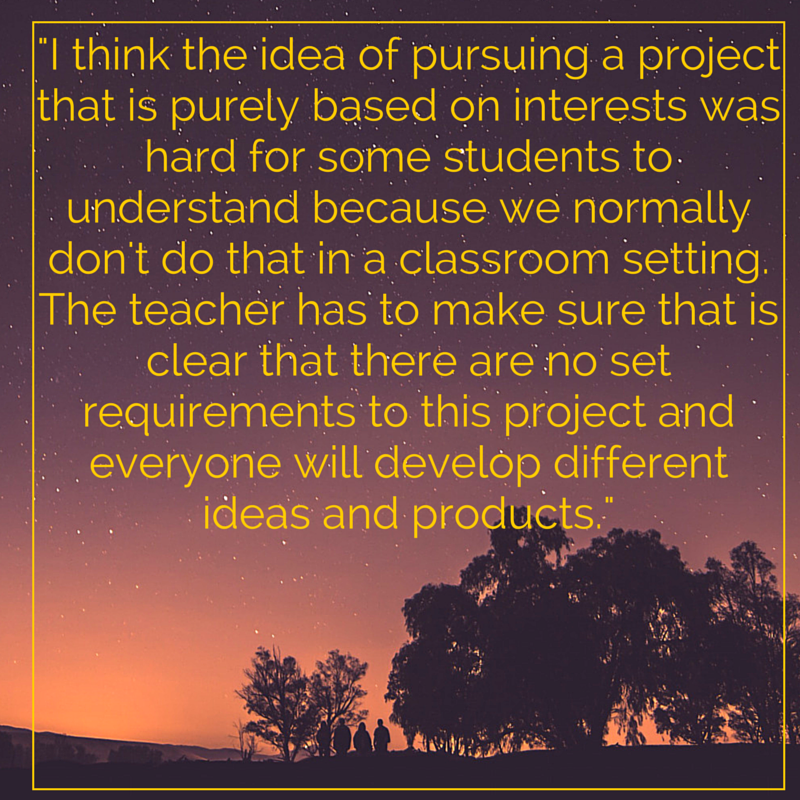 "I think the idea of pursuing a project that is purely based on interests was hard for some students to understand because we normally don't do that in a classroom setting. The teacher has to make sure that is clear that there are no set requirements to this project and everyone will develop different ideas and products." "The advice i would give to the teachers who are doing the 20time projects in the future is that you have to tell your students that it is okay to end up not having a solution because when i wanted to do a 20time project on processors, it is because i was passionate about it and i wanted to learn about them, but i was not able to do it on something i was passionate about because it needed to be something that had a problem and we needed to find a solution. I think the kids should be allowed to do something they are very passionate about so they can learn more about it and not be confined to something that needs a solution, isn’t that the true definition of 20time? The passion to learn something you are interested in." "My advice would be to reconsider the blog posts. Pesonally I don’t really see how that has anything to do with our projectrs, and it would also make the project go more smoothly, because than we don’t have to worry about how long the blog has to be and about the grade we get on it.We should only have to worry about our project, and at least have the freedom to organize it however we would like." "I would start the project way earlier in the school year. everything was very cramped and rushed I feel. Also I think you should somewhat narrow the options people can have, when it is so broad I found it so hard on what to choose as my subject." 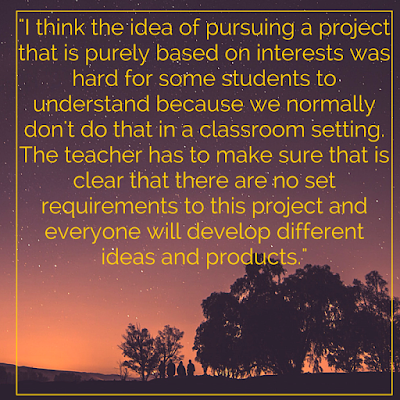 "The advice I would give teachers who are doing 20time project would be to let the students decide the topic of their interest so they can learn and work more on their topic of interest. The more the student is passionate and fascinated by their topic the more they will do a better job. If you assign a student a project to work on you don’t know if he will enjoy doing it or not. A teacher should let her student know he/she can get help from you as well. I also feel like teachers don’t need to put a date on when something should be done because you don’t know whether you have accomplished your goal or not. A teacher should be supportive of any topic the students chooses to do because it may cause them to not want to do their original topic if a teacher doesn’t support his/her idea. I found that making a blog on my topic made my information more organized which was very useful and helpful." There's more where that came from. If you're interested in reading it, please let me know.